Crafters looking yarn for their next project have many options. Available in a variety of weights, Perfection is a great go-to choice as a hard-wearing, easy-care yarn with an extensive color palette that will last! Bonus, all Kraemer Yarns are made in Nazareth, Pennsylvania. We source American fibers to support American farmers and workers. As the manufacturer, we can provide our yarns directly to you! Shadow Knit Checkered Hat in Perfection Worsted is a new pattern by Clara Messesa for Kraemer Yarns. Shadow knitting is also known as illusion knitting when you look at the hat from one direction you see stripes, but from another perspective, you see the checkered squares. Pretty nifty, right? Paula Herbert's Cowl & Snood pattern is a simple, garter stitch cowl, which can be worn as a snood. Did you know that snood is the word for a tubular scarf that sits higher up on the neck and more like a hood? It is attractive and warm, knit flat and seamed in Perfection DK. 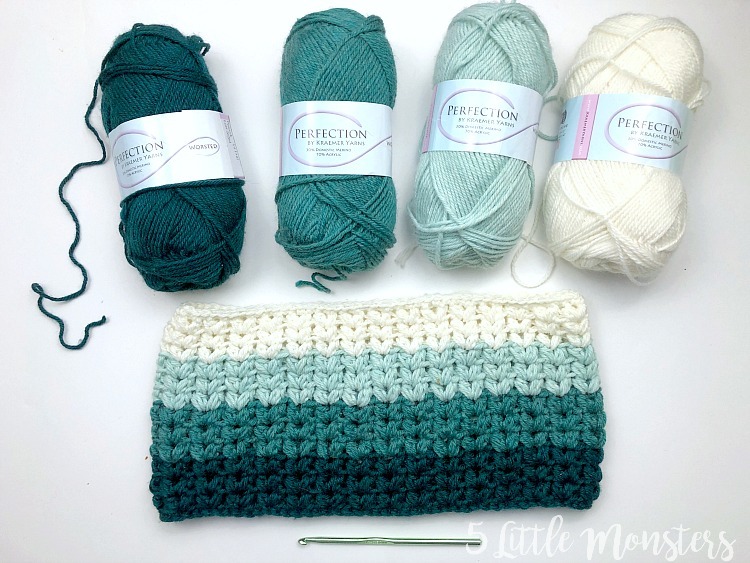 Perfection is a great choice for crochet projects too! The Frosty Forest Cowl by Erica Dietz of 5 Little Monsters uses Perfection Worsted and puffy v-stitches to create a nice, squishy texture on this cowl. Four colors arranged from dark to light gives it an ombre type effect. We can’t wait to see the color combinations you select! We love to connect with you in our Facebook group, Ravelry group, or on Instagram. Share your Perfection projects and inspire others! We stand behind every skein and hank of our yarn. If you are ever not satisfied with the quality of our yarn, we will provide you with a full refund.